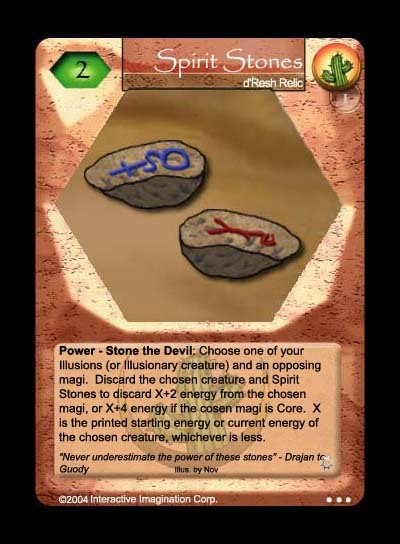 The idea of Spirit Stones hails back to the Hajj, where one of the rituals of the pilgramage is that they throw pebbles at a rock that is supposed to represent the devil. This is a d'Resh card though, so it gained a burn ability, but can only be triggered if there's an illusionary creature in play. The larger the creature, the larger the savings and the more the damage. It even has a built in anti-Core aspect to go along with its name. The artwork is one of my first few attempts at original MND art. I don't think it's excellent, but it's not disastrously horrible either.